Games that fail to get a proper launch, development, or that have poor decisions made by the publisher / developer are seeing massive engagement bleed. 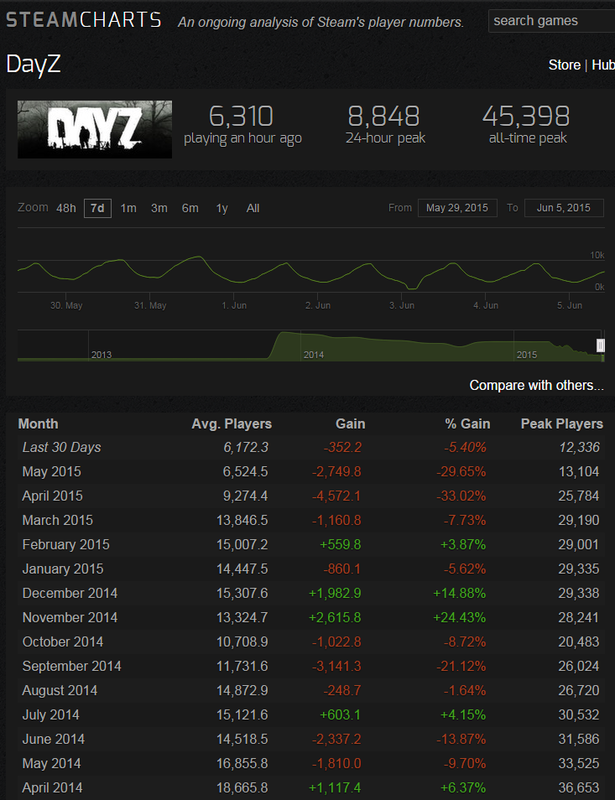 I started looking at stats for games that are showing this trend after watching DayZ start to dive. Facing a massive decline in player engagement since the .55 patch rolled out, breaking loot spawn and instituting mechanics that result in starving to death within 30 minutes of spawning. Players are leaving... in droves. People aren't going to continues to support or play a game that they actually can't play. Alpha or not. Alpha is no longer an excuse. A great shooter that is hindered because of the platform it is on and poor launches of antecedent titles. People flatout avoid Origin. Another example of a fun game... hurt at launch and then suffering rapid player bleed off... also on Origin. Today, they can't even seem to give Titan Fall away. Which is sad. I really like it. I tried to find online server stats to show populations over time, but there aren't any. A game from the Zombie Panic! mod devs with a lot of potential. Released and then ignored. So much potential wasted. You want in game phone wallpapers?! Certainly enough of those. 98 of them actually. What are some other games that went through this? Was there a resurgence or did the game die? what about dying light? I have felt that when they released the dlc that was not worth a hoot they lost alot of people as well. Evolve would seem to fit the bill. They've dropped from a peak of 27k players in February to less than 2k in the last 30 days. 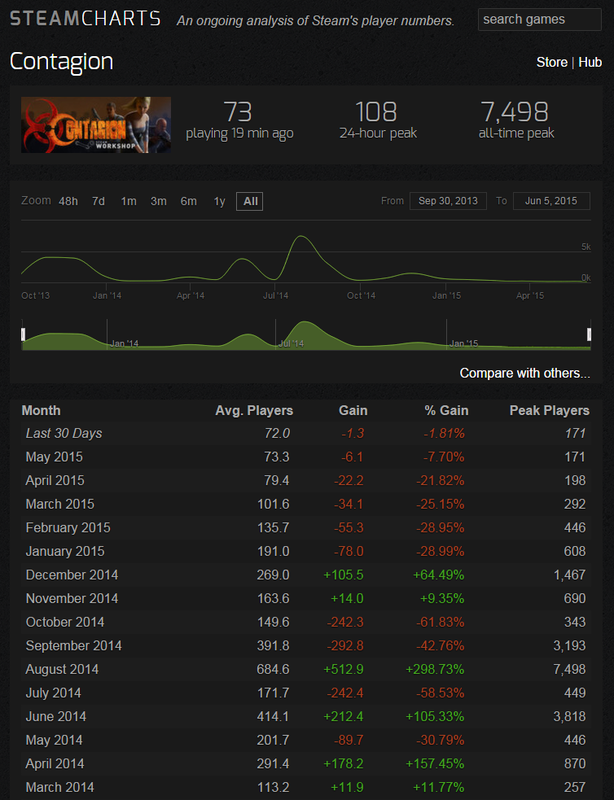 Particularly sad when compared with Left 4 Dead 2 which has a peak of 10k players in the last 30 days. Don't you think, though, that this is more natural to see in a game skewed more toward the single player (rather than open-ended multiplayer) experience? You're not kidding. I didn't realize it degraded so bad. Accurate statement. Battlefield Hardline is about to release the first expansion and I feel like it will not do much to boost engagement. Perhaps, but if DLC takes too long to come out, people have moved on already. I'd venture that people rarely go back to a game they have uninstalled to play DLC if it has been more than 3 months. Personally I think it's less about time lapse and more about quality. Take Dying Light for instance--I'd have rather waited 6 months for a well done campaign DLC than the crap they've been dropping. Bad or worthless DLC is certainly a problem as well.